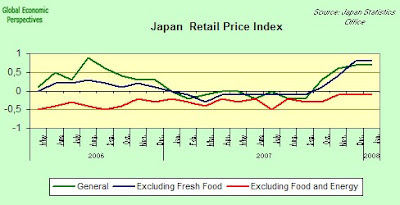 Japan's consumer prices as measured by the General Index (ie including food and energy costs) rose for a fourth consecutive month in January at a year on year rate of 0.7%, maintaining the fastest pace achieved in more than nine years, as companies passed the higher costs of oil, wheat and soybeans onto consumers. Core consumer prices (ie stripping some foodstuffs) climbed 0.8 percent from a year earlier, the same rate as December. Until last November, core prices, which exclude fruit and vegetables but include other foods such as rice and bread, had either hovered around zero or fallen for nine consecutive years. However the "core-core" index (ie stripping out both energy and food) continued to give a negative reading and was down year on year by 0.1%, a stituation which induced Japan's economy minister to say that progress out of deflation has come to a “temporary standstill". Which only leaves me wanting to say "I agree". The inflation in food and oil seems set to continue however, and this is bound to have an impact on the tight wage packets the Japanese have been receiving of late. Japan, which is Asia's biggest wheat importer, plans to increase grain prices to flour millers by 30 percent in April, according to the Ministry of Agriculture, Forestry and Fisheries, and wheat prices surged to yet another record last week. Crude oil has also been climbing hitting a record $103.05 a barrel earlier this week. Japan's petrol prices averaged 154 yen a liter ($5.60 a gallon) in January, close to December's record level 156 yen, according to figures from the Tokyo-based Oil Information Center. 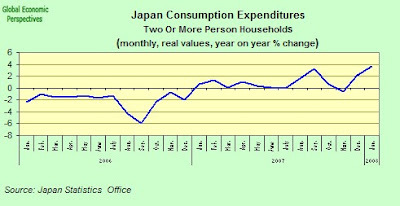 Household spending has been visibly resisting the economic slowdown, and climbed 3.6 percent in January from a year earlier according to the latest data from the Japan statistics office. 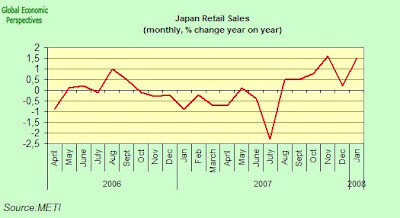 And according to a separate report from the trade ministry, Japan's retail sales rose for a sixth consecutive month in January, climbing 1.5 percent year on year, in part because higher oil prices boosted revenue at petrol stations, but if you look at the chart below it is clear that there is - for some curious reason that I have yet to fathom out - more life in Japanese consumption since last autumn. Gasoline, kerosene and other fuels drove 44 percent of this months gain and car sales made up for more a third, the report said, but again this in itself is curious, since in the US and Europe at present - for example - car sales are falling, not rising, as petrol pump prices rise. Economy Minister Ota, however, wisely continues to exercise caution, saying that while the consumption figures show spending remains "solid", waning confidence would also seem to indicate that households may start to pare back spending at some point in coming months.